Jesus answered, “This voice has come for your sake, not for mine. Now is the judgment of this world; now the ruler of this world will be driven out. And I, when I am lifted up from the earth, will draw all people to myself.” He said this to indicate the kind of death he was to die. The crowd answered him, “We have heard from the law that the Messiah remains forever. How can you say that the Son of Man must be lifted up? Who is this Son of Man?” Jesus said to them, “The light is with you for a little longer. Walk while you have the light, so that the darkness may not overtake you. If you walk in the darkness, you do not know where you are going. While you have the light, believe in the light, so that you may become children of light.” After Jesus said this, he departed and hid from them. John 12:30-36. As a child, I always dreaded that moment in the evening when my mother turned off the light. I was firmly convinced of monsters and the idea that they had particular sway during the night-time hours. (Up until the age of around eight, my chosen career path was “vampire killer.”) Years later, I decided that while there are certainly monsters in the world, we make our own evil. Now, I’ve come full circle and have accepted that there really is something out there called evil, and that evil is a spiritual reality. In this passage from John’s Gospel, Jesus encourages us to walk in the light “so that the darkness may not overtake you.” Once overtaken by darkness, we struggle to see where we’re going. We take the wrong path; we get lost. Jesus tells us that “the light is with you for a little longer.” Deep into this journey through Holy Week, we get the feeling that we are walking at dusk, as the light is fading. This passage resonates with the opening of John’s Gospel, which described the life of Jesus as the light of all people. 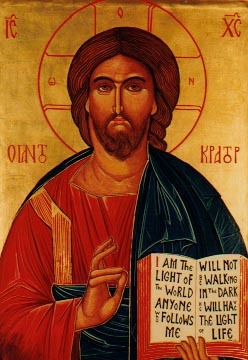 “The true light, which enlightens everyone, was coming into the world.” John 1:9. If we believe in this light, we become children of God, or “children of light.” John seems to suggest that living into our Christian life will work a fundamental change in our spiritual DNA. As we travel through these scriptural pilgrimages during Holy Week, we should remember that Jesus calls us to become children of the light, reflecting the light of Christ into all the dark places of the world. Jesus does not suggest that His followers will not experience the darkness. Good Friday teaches us that’s just not the case. Christianity does not operate as some sort of good luck charm or talisman against the darkness. Jesus’ assures us of something quite different. He tells us that the darkness will not “overcome” those who walk with Him. Once again, that’s got to be good news. This entry was posted in Uncategorized and tagged Anglican, Bible, Disciple, Bible, Christianity, Darkness, Death, Disciples, Dominican, Episcopalian, Gospel, Gospel of John, Holy Week, Jesus, Lent, Moral Theology, Pastoral Care, Religion, Salvation, Scripture, Sin, Spirituality, the Light of Christ, the Light of the World, Theology. Bookmark the permalink. One of your gifts, Brother James, has to be the ability to find a turn of phrase that expresses what we, or at least I, find so hard to express in words. My spiritual DNA says thank you to God for giving you that particular gift, as it gives me a way to share my faith with others in a way that may be more meaningful to them. Thank you for offering that gift, and a blessed Holy Week to you. I have been wondering what my gifts were, since I’ve failed so miserably at being a vampire killer (wry grin). I wish you a wonderful Holy Week, and look forward to the joy of Easter. I have been captivated of late with the “Now is the judgment of the world; now is the prince of darkness cast out.” Is it possible that in Christ, the final judgment (not for “deeds done in the body”) but the ultimate judgment is behind us for those of us who face an infinite and everlastinig future? The implications are captivating. This text has been using me for months now. It’s a phrase that captures us, isn’t it? In the Greek krisis, I find it even more interesting. It seems Jesus speaks of a krisis (judgment) in the past tense. Thanks for your thoughts. I believe you are right, Brother! Even though we are hard-wired to God, he does seem to affect a change in our “spiritual DNA” when we are ready (maybe not quite so willing!). May God give you the strength and inspiration to survive this week. Burn up in the service of the Lord! Yes, I think Christianity is a bit like a retrovirus, remaking our DNA as we become more and more Christ-like. And yes, I chuckled at “The Elder” my own self. There is such poignancy in your thought that deep into this journey through Holy Week, we get the feeling that we are walking at dusk, as the light is fading. It is terrifying, this thought of the approach of deepening darkness, not only this week, but inevitably in our own dark nights. Yet how hopefully we can walk into those dusky places, knowing that we will see that little point of paschal light. It may be a smile from a friend, a bit of better news–and most profoundly, the promise that God is still with us. Yes, I think it can be quite frightening. But for Jesus’ promise that “I will be with you always, even to the end of the Age” we would have good cause for terror. I love the image of the paschal light. At least in my church, it’s a fairly small light in a large dark place, which then becomes the source of many lights throughout that holy room. Is there a better way for two Fathers, one the Son and the other the Father, while both being Fathers to designate which Father, the Father or the Son is posting? I chose “the elder” because of my many, many years on so many of you all—glad it gave a chuckle. As always, you’re most welcome. Thank you for your support and encouragement. I couldn’t help but think of it…thanks for this beautiful reminder- I too always feared the dark as a child (maybe it’s pretty common, I don’t know). Thank you so much for the Fox reference. I don’t know his work, but he’s on my reading list, and I appreciate the reminder. Your words are a wonderful compliment to my devotional this morning from J. Philip Newell’s “Sounds of the Eternal: A Celtic Psalter.” I’m thinking maybe you should quit your day job and start doing this full time. We would all benefit, as you can clearly see from all the responses you get. A friend of mine works with Newell. I know his work a little, but not as much as I’d like. Regarding quitting my day job, I think my partners might suggest I already have (wry grin).